Looks like cannabidiol hemp oil, or CBD, is galloping into the luxury lanes. 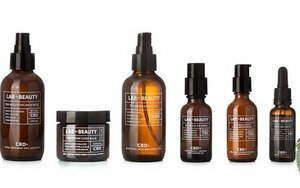 Lab to Beauty introduced its CBD Skin Care Collection in Barneys New York. And Neiman Marcus just announced that it’s stocking seven different brands of CBD products as part of the new year’s Trending Beauty assortment. The Lab to Beauty line, created by sisters Katherine and Alison Ragusa, includes a face wash, masks, moisturizers and serums, and is scheduled to expand to a hair, body and therapeutic lines this spring. And at Neiman Marcus, new offerings include products from such brands as Code of Harmony, Sagely Naturals, Cannuka, Cannabliss Organic, Vertly, Ildi Pekar and Yuyo Botanics. While there’s plenty of buzz in the world about the fast-growing cannabis market, CBD’s inroads are less clear, since it’s being introduced in products that range from nutraceuticals to eye creams to soft drinks. And there’s still scant evidence that CBD is effective as a beauty aid. There’s also plenty of confusion about its legal status, further muddying its inclusion in clinical trials. But marketers are quick to make claims about stress-reduction and pain-relieving benefits. And many of these beauty products claim to reduce redness, irritation and even acne. Some academic researchers have found support for CBD use for treating chronic pain, chemotherapy-induced nausea and vomiting, and for spasticity in multiple sclerosis patients. And some believe it has potential for treating anxiety, arthritis, depression, diabetes, and cancer, reports WebMD.